When you hear someone going on a trip to Europe, the top-of-mind cities are always Paris, Rome, and London. I guess it’s media’s influence that made these cities so desirable – in movies, series, books, among other things. So when I was planning for my Europe trip, I was choosing between two things, visit these popular tourist destinations OR go for a cultural route (and visit family). Rome and Paris also had cultural/historical sites. Admittedly, the expenses and lodging were more expensive than Central Europe when I was doing the costing. London, BTW, needs a different visa. For me, it’s more ideal to have a separate trip for London/England if the vacation time is short. Another reason why I chose this route is because of my background in music. During college, I was part of a chorale group and I wanted to see the places where esteemed musicians came from. Lastly, It’s easy to travel around Central Europe. Countries are an hour or two apart and you can visit a lot of places even if you have a limited stay. You can start your journey from a city in the north, then move towards the south. My entry point was Copenhagen, as the Denmark part of my trip was sponsored by Arla, a dairy cooperative there (more on this later). Afterwards, I moved to Vienna (Austria), the center of my trip. Since Vienna’s position is strategic, I left my things there during the day, traveled to different place, and came back at night. It was easier for me to do it this way since I didn’t want to carry luggage in every destination. It slows you down. I was able to see Salzburg (Austria), Bratislava (Slovakia), and Budapest (Hungary) on day trips instead of staying overnight. It depends on you if you want to follow what I did or have your lodging at a every city you visit. When I was budgeting, I computed for both options. I remember that staying at destination was a little cheaper than what I did, but the gap was not significant. In the end I chose the convenient option. 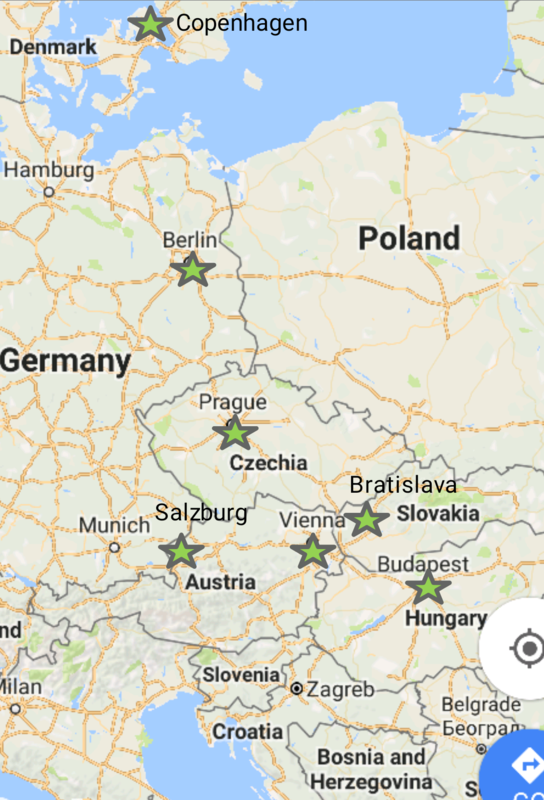 The last places I visited were Prague (Czech Republic) and Berlin (Germany). I headed back to the north as my return flight was from Copenhagen as well. I started my European Tour in Denmark. After arriving at Copenhagen Airport, our team went straight to Aarhus, where the Arla HQ was located. We learned that Arla was a full-blown cooperative, where the farmers own the shares and has a say on how things are run. It’s very different from the setup in our country where farmers are suppliers to big corporations. We also visited a farm called Faregard in Holstebro, about 1-2 hours drive from Aarhus. There we met a Birtit and Rasmus, a mother and son tandem who run a dairy farm. We had a chance to milk cows (Yey! ), and learned how they keep producing high quality dairy in their farm. Did you know that when a cow moos, it’s a sign of stress? The farm was very quiet, and the cows seldom moos because they’re living comfortably. We were also able to visit the Arla factory, where we saw how cream cheese and Lurpak (the best butter in the world) are made. At the end of the educational tour, we had a chance to taste all the flavors of cream cheese that they have. My favorites were tomato and lactose free. Curry was good too! 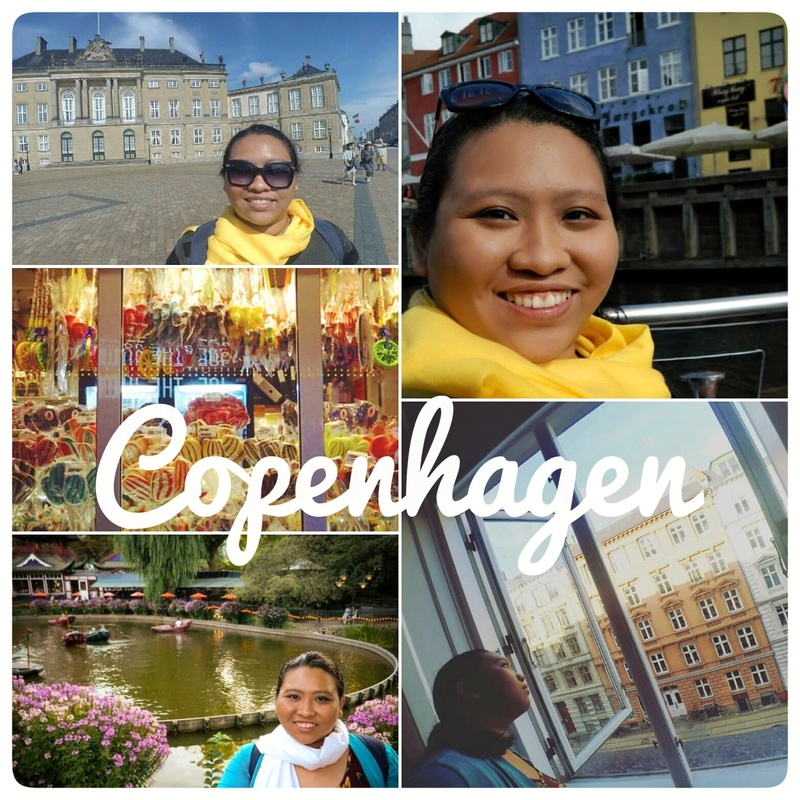 You can read more about Arla and our adventures in Aarhus, Denmark at Cheryl Tiu’s blog: Getting To Know Arla Dairy In Denmark– Did You Know The Company Is Owned By The Farmers? I had a blast during our short stay in Copenhagen. After checkin-in at our hotel, we headed to Tivoli Garden, an amusement park in the middle of the city. It’s known as the one of the oldest theme parks ever built in the world. We also took the Copenhagen Canal tour where you get to see the city via boat. You’ll pass by historical landmarks and the famous Little Mermaid. Vienna is probably the city I enjoyed the most. Not only because my family is there, but everything is just so picturesque and beautiful. Must visits are Belvedere, Schonbrunn Palace, Rathaus, and Wiener Riesenrad (ferris wheel). Transportation is also very efficient. In my opinion, they have one of the best transpot systems in the world (Seoul is still my best bet). I also got to see the Wiener Alpen (Schneebergbahn), it’s a 1-hour drive from the city. You can get to the top of the mountain by riding the Salamander train. It has an awesome view and a great attraction to visit. I noticed that families visit this place for a weekend picnic. You can bring your own food or buy food and beer at the restaurant on the mountain. This part of my trip is not included in my costings since my uncle covered the expenses. 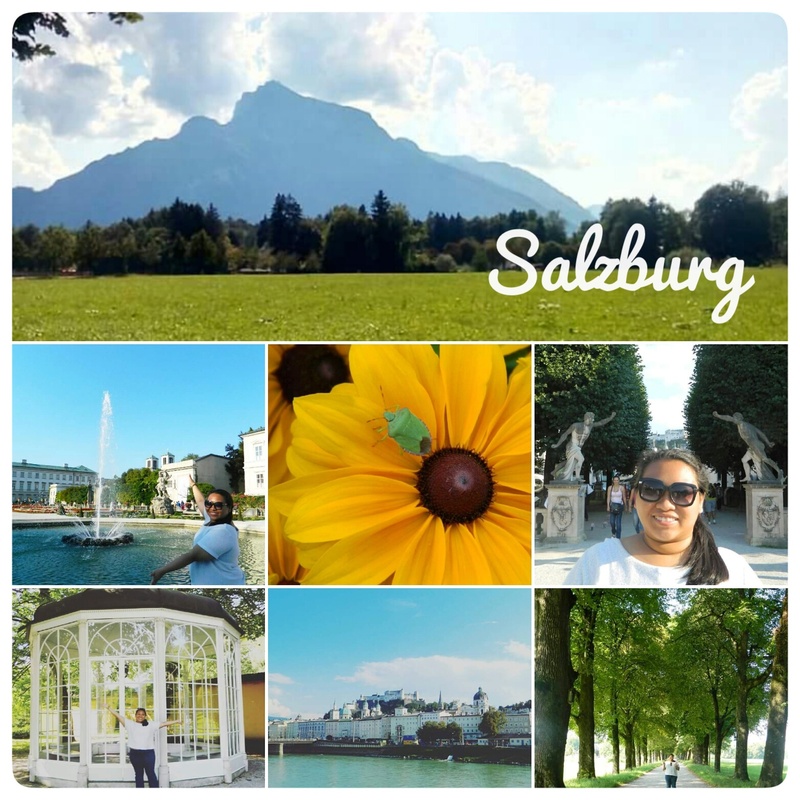 Salzburg is a must visit if you are into classical music. It’s known as the shooting location for the movie, The Sound of Music, and it’s also the birthplace of Mozart. Tip: buy a ticket for the hop-on hop-off bus, it really makes the experience convenient. Attractions are far from each other and commuting will be expensive. Also, if you really want to enjoy this place, stay for 2 days. A day here is not enough. Best time to visit is Spring. Old town Bratislava is great because it’s compact and fun. You will see a lot of statues doing funny poses as you roam the area. Food here is really great. We were able to find a good restaurant in old town and enjoyed Slovakian cuisine. I think the best and most tiring experience in Bratislava is visiting the castle. It rests on top of a hill which you need to climb for a good 20-minutes. I sweat this castle is worth every sweat. It’s so majestic that it’s my favorite castle. Yes, I liked it better than the ones I saw in Denmark and Austria. Budapest also a good place to visit. The best view is of course, at the Budapest castle, where you’ll be able to see “Buda” and “Pest” which is separated by the river. I was a bit confused by the transport system, since the city runs on mostly trams. I prefer trains, since it’s easier to map your way through a city through subway. But important places were visited, so it’s okay. If you go to Budapest, you have to visit the cathedral. When I entered, I was awestrucked (Yes, this is not a real word) when I saw the interior. It’s the most beautiful church I’ve seen. Also, I went up the cathedral observatory where you ride an elevator to the top of the church’s roof terrace and you can see a view of the city. There’s a fee for this, about 5 Euros or less. I cannot stress how beautiful Prague is. A visit here should be at least 2 days. Transportation was easy, since my hostel was at the old town, near Charles Bridge. There are a lot of events and museums around that can be enjoyed. This is where I first experienced a free walking tour. I got a flyer from my hostel front desk and just decided to join the tour in the morning. You’ll learn about the city’s history, culture, and roam around the old town during the 2-hour tour. I wasn’t tiring at all because we stopped every time we were somewhere important. I didn’t take a lot of pictures during the tour as it has sensitive parts where things stories about the world war was covered. Out of respect, I decided not to take photos. Also a must visit is the Petrin Tower, their replica of the Eiffel Tower. It was small, but since I like going to Eiffel Tower replicas, I just had to go there. I didn’t have much time to explore Berlin, as I only had half a day to spend there. I had an early bus ride back to Copenhagen. Never the less, I still enjoyed the this short stop. Of course, a visit in Berlin is not complete without seeing the Brandenburg gate. Aside from that, I just wandered around its vicinity. Spent most of my time in Madame Tussauds wax museum. The highlight of this stop for me is seeing the One Direction wax figures and Star Wars exhibit. The geek in me was so happy. I’m a bit iffy to share the planning costings I used because it’s been a long time since the trip and I had to recreate this from memory. I have my hotel bookings and bus ticket prices in tact, but i lost my day-pass tickets and food receipts. What I have here are just estimates. For food, I generally go to groceries. Sometimes I try restaurant food but only when I really, really want to. A friend of mine spent Php 8,000 for 8 days in Italy and toured 12 cities. He was able to do so by planning carefully and saving-up on food by eating fruits and veggies. He was able to find a vegetarian pizza there too! For city transportation, the ticket price and duration vary per city. Some cities offer 3-day and 24h passes. Some only offer a day pass which expires at a certain time, not 24h usage (this is Berlin, BTW). Budapest offers a group ticket, which is cheaper than buying individual ones. The most pricey ticket I bought is in Berlin (7 Euros), so I guess it’s safe to allocate that amount per day. I actually spent about 25% less than than my estimated budget. During my trip, there were impromptu decisions/changes I did. I also didn’t spend much of my miscellaneous and food budget since I go to groceries for food and didn’t buy a lot of souvenirs. Water – During my trip from Copenhagen to Vienna, there was a stopover in Berlin. After I bought food at McDonald’s (because some things never change), I decided to stop by water for the rest of my trip as well. I just grabbed the cheapest 1 liter bottle I could find. This was a big mistake, because it turns out a lot of people there actually preferred carbonated water – which was what I bought. I didn’t know this because the label was all in German (huhuhu). My relatives explained this an told me that I should look for “Ohne” on the label. It means that it’s still water. Condiments – I’m a big fan of condiments, especially ketchup. In the Philippines, you can easily ask for these for free, so it was a big shock for me to find out that you need to pay for these in Europe. Yes, you have to pay even if you ordered fries! So, to spare your change, just bring your own packets of condiments/ketchup, if you cant live without these. Restrooms – It’s hard to find free-to-use restrooms in Europe, so you should always have coins ready to pay the maintenance fee. Luggage – Limit your luggage to 10-15 kg. I’m serious with this one. It’s hard to drag your luggage on cobblestone streets, which is pretty much most of the old towns you’ll visit in Central Europe. If you really want to buy souvenirs, keep it at a minimum while your touring and splurge at the last stop, before checking-in at the airport. Bring a portable scale to measure your luggage and know if you can or can’t bring home anymore souvenirs. Train, plane, or bus? – It depends on your priority. If you want a cheaper route, I suggest taking buses. If you want an efficient route, you can take a plane. Trains are usually the mid range, a bit more pricey than a bus, but it’s more comfortable. I used the GoEuro website to search and compare travel routes. They have prices too, and you can already book online. I mostly used Flixbus when I was traveling. I found out about it in GoEuro. To make things easier, I saved the Flixbus app and booked my tickets online. Tickets online are cheaper than the ones in the terminal. Also, the prices increase as the departure date nears, so I suggest to book them early. Hotels / hostels – When applying for a visa, you need to submit hotel bookings. At first, this ruling makes no sense for me because booking costs money. Why spend money if you’re not yet sure you’re going to be granted a visa? The way around it is Booking.com. There are hotels/hostels here that allow free cancellations in a given time frame. You can search for hostels, budget hotels, and high-end ones here. Since my visa was approved, I didn’t need to cancel my bookings and used them during my trip. Chocolates – Chocolates are generally cheap in Europe. Don’t forget to to stock-up.